Hue Lights brings you the perfect marriage of hardware and software. 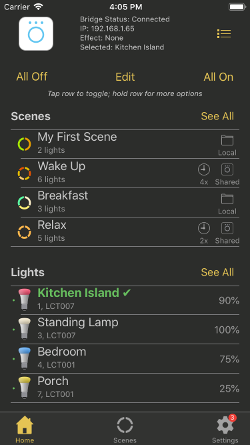 Get the most out of your Philips Hue System with fast widget support, shared Scenes and Groups, comprehensive scheduling, customized sequences, Apple Watch support and powerful light controls. Hue Lights offers excellent support for the latest Philips hardware including Hue motion sensor, Hue dimmer switch, and Hue Tap. Create multiple time intervals for motion and non-motion events. Control separate Hue dimmer switch buttons using long-press and short-press actions. 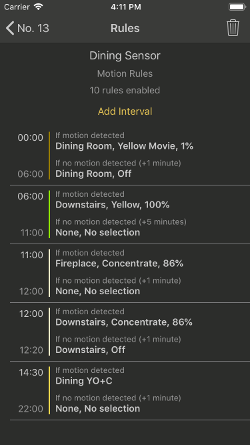 Scene details, schedules, motion sensor time intervals, and switch details are stored directly on your bridge for easy sharing with other devices on your WiFi network. Enjoy spectacular choreographed audio/visual background animations and sequences! Bring your Hue Lights to a whole new level with multi-track, synchronized, and visually appealing light animations. 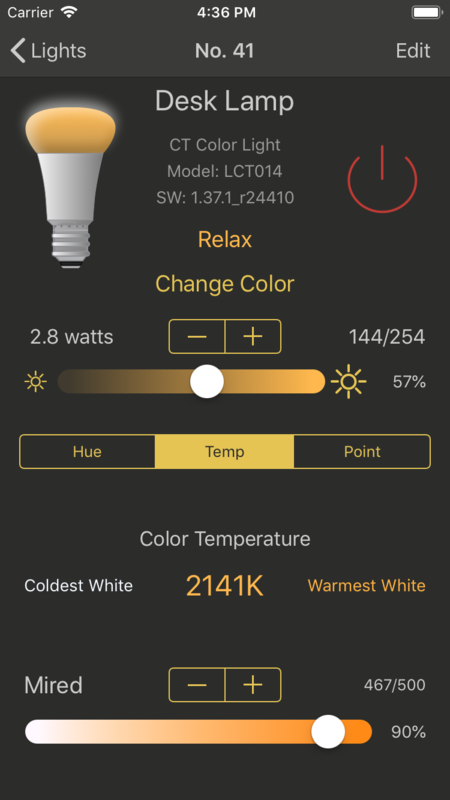 The "Hue Lights" third-party app for iPhone, iPad, and iPod Touch gives you fast, accurate, and complete control of your Hue Personal Wireless Lighting System. Create personalized categories, scenes, and favorites. 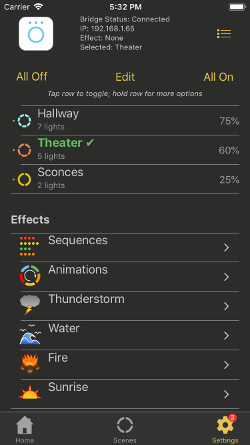 Access frequently used lighting scenes with just one tap. 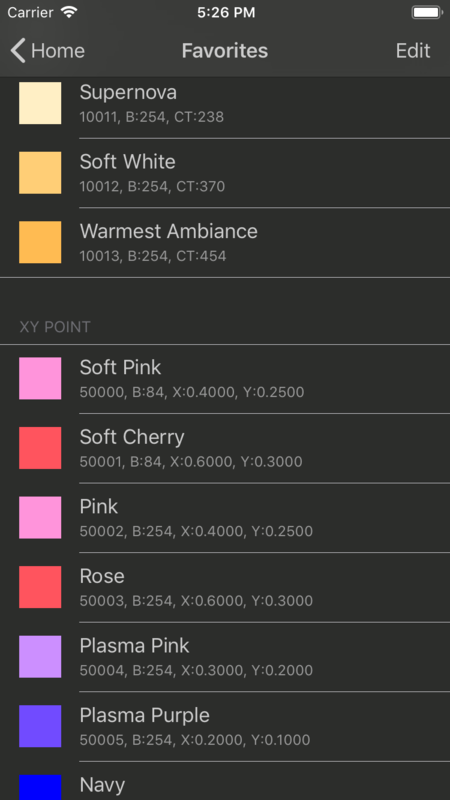 Set up your favorite colors with precise control over all possible light attributes. Apply favorites to lights, scenes, and groups for quick set-up and changes. Questions? Check out our Frequently Asked Questions section. You can contact Hue Lights support via email, Twitter, Facebook, or Skype. Why try Hue Lights? 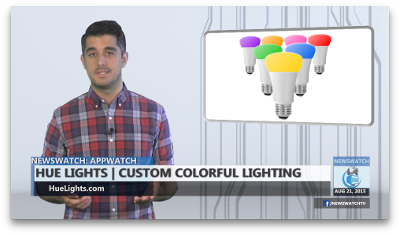 Watch the Hue Lights Custom Home Lighting NewsWatch Review! If you missed this Hue Lights Review on the Discovery Channel, you can see a quick demo from the NewsWatch team. Apple Watch support is here! Experience the time of your life with Hue Lights. Activate scenes, adjust group brightness, and trigger alerts all from your Apple Watch. 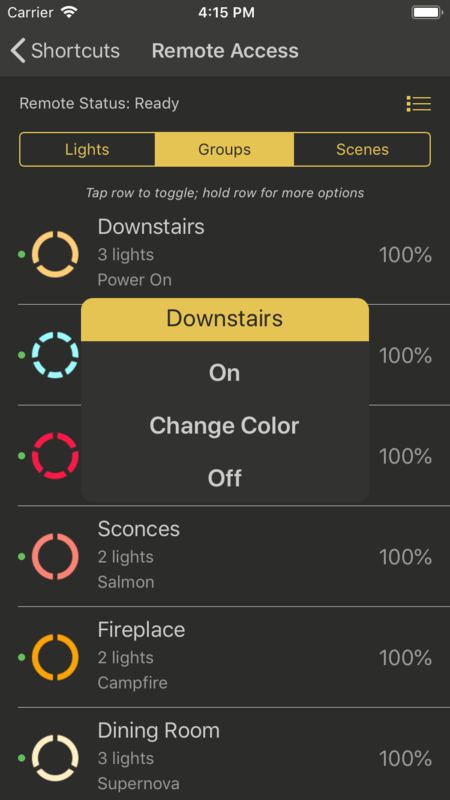 Experience the speed and simplicity of Hue Lights on your Apple Watch. The same fast widget code for quickly activating scenes and groups is now available to any Apple Watch owners running iOS 8+ on an iPhone 5 or later. 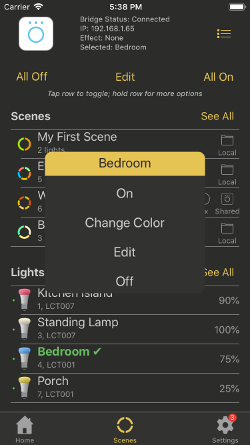 Updated 2019-04-02 Hue Lights v3.4 is now available with extensive support for the Philips Hue outdoor motion sensor! Create multiple time intervals. Turn on or off any of your lights when motion is detected. Activate scenes or groups for both motion and non-motion events. Use multiple motion sensors to create follow-me light sequences. Hue Lights also exposes the hidden temperature sensor within each motion sensor. Turn some of your lights blue when it is too cold. Turn lights red when it is too hot. Add flashing alerts to temperature thresholds. Special configuration options are available for the light level threshold. 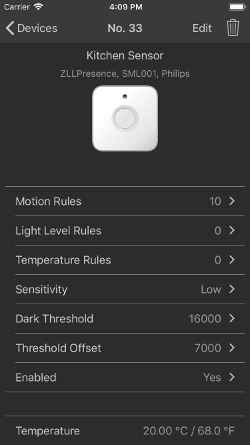 Turn lights on or off using only light level triggers. More details are availble on the Release Notes page. If you were having trouble with remote access over the last few days, this issue should now be resolved. Please contact support for help with any problems. There is also a FAQ that has common questions and answers. 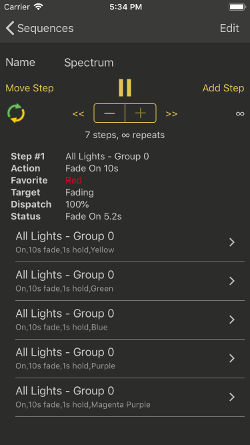 If you have trouble adding new lights or devices to your Philips Hue bridge, try to use Touchlink. This can often force difficult lights to join your bridge. 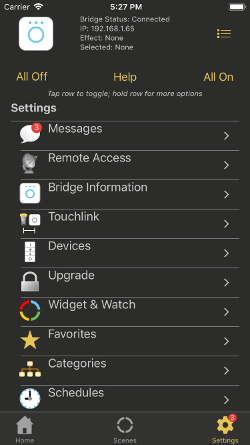 Tap Settings → Touchlink → Force bulb to join bridge. Be sure to review the Hue Lights Best Practices guide for general help. Specific answers to most questions can be found in the Hue Lights FAQ. There were changes introduced in bridge firmware with API 1.28 that impact scene activation with Alexa. If you are using this version of firmware, your Alexa scenes will be restricted to a single room. If you are not using Alexa and want to create scenes with arbitrary lights, then make sure your Room is set to Multiple. This is the default setting. Scenes that have Room set to Multiple do not work with Alexa. Does your yellow color have a green tint? The latest generation of Hue bulbs use slightly different internal LED components. Try the new Amber color in Hue Lights v3.3 for a better looking yellow on the latest bulbs. If you recently purchased new bulbs and are having trouble linking them to your bridge, then you should use Touchlink. This can force bulbs to join your bridge even when they are already linked to another bridge. 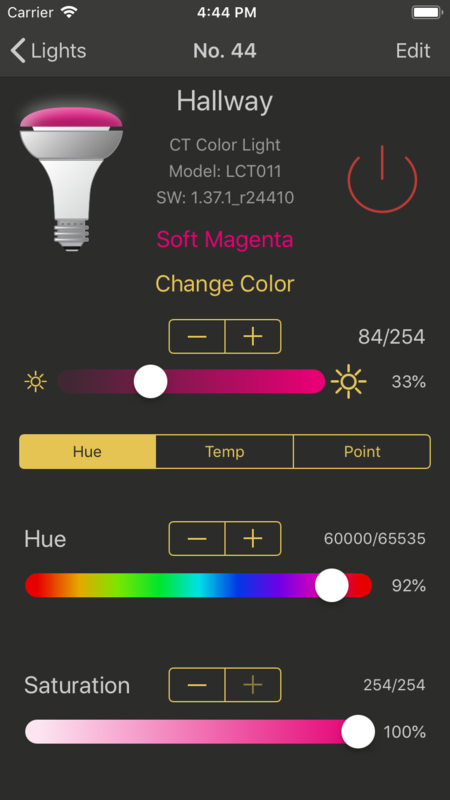 Hue Lights v3.3 unleashes the power of your Hue dimmer switch and Hue Tap! 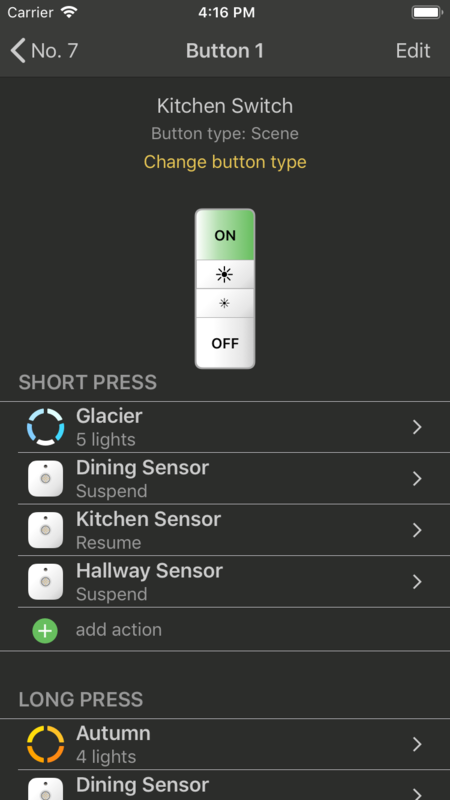 Suspend or resume up to 7 motion sensors using only your Hue dimmer switch or Hue Tap. Check out the Release Notes for a full list of enhancements. 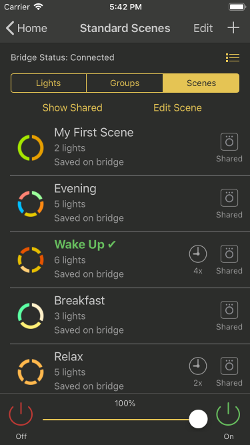 If you add new lights to your Philips Hue bridge, you can quickly add these to all of the included scenes. Tap Settings → Update Scenes → Update. There are many more tips available in the Hue Lights FAQ. Support is also available 365 days/year. Outdoor lights are now available. Accent your yard with stunning green and blue colors. The Richer colors and scenes In-App purchase available in Hue Lights v3.2 will turn your backyard into a spectacular oasis! Create beautiful, multi-room scenes with richer colors. Use your voice to activate these scenes with Amazon Alexa. The new Richer colors and scenes In-App purchase offers you 100+ new colors and 10 custom scenes. These work great with the Philips Hue Generation 3 bulbs. See the latest FAQ for steps to create a custom scene for use with Amazon Alexa. You can also use Hue Lights v3.2 to create recurring schedules, turn lights on/off at sunrise/sunset, and control your lights from anywhere in the world. This release update keeps all of your favorite features while improving the layout, navigation, and shortcuts. Let Hue Lights create the perfect ambiance for each area in your home. Check out the updated Quick Start Guide for basic information, best practices, and expansion tips. There is also a growing list of compatible third-party hardware available for use with your Philips Hue bridge (e.g., IKEA TRÅDFRI LED bulbs). In some cases you may need to update the firmware of these third-party bulbs using the manufacturer's hub. The latest firmware available on the Philips Hue bridge supports ZigBee 3.0 which expands compatibility with a wider range of products. Help for most problems is a click away. Check out the Troubleshooting section in the Hue Lights FAQ. Try some of these suggestions when you have issues. It should solve 90% of problems. If you are planning to add more bulbs to your bridge, pay attention to the bulb generation. There are currently three generations available. The latest, Generation 3, have richer blues and greens. Look for "Richer Colors" on the outside of the packaging. The colors of the Generation 3 A19 bulbs look similar to the Lightstrip Plus and Hue Go. The blues and greens are more saturated, so keep that in mind when placing them near Generation 1 or Generation 2 bulbs. It will look better to have the same generation bulbs near each other. The latest Generation 3 bulbs also dim very low. This enhances both wake-up features (e.g., Perfect Sunrise) and sleep features (e.g., Water with Sunrise Colors, Thunderstorm, and Fire). Stay up to date with the latest Hue Lights app news by following us on Twitter. Enhance your smart lighting environment with ENERGY STAR® certified models, , updated UI navigation and shortcuts, and several app improvements. For a summary of free features, please read the FAQ item, What features are available with the free version of Hue Lights? This should get you started. There are many more FAQ entries available for later reference. Check back periodically for new content. 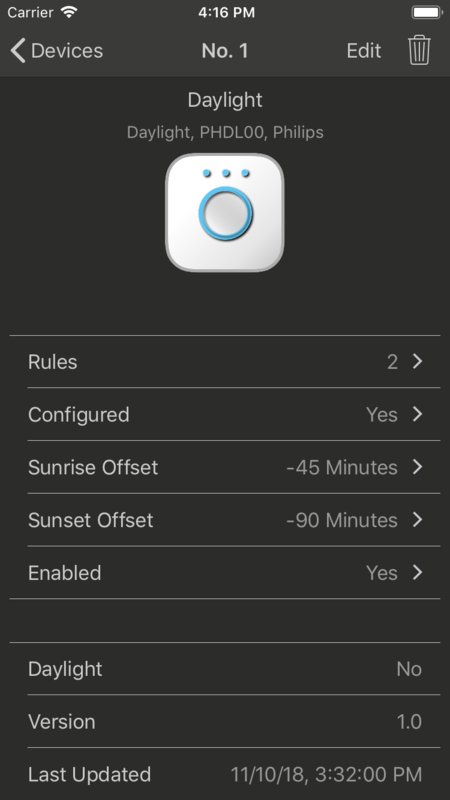 Hue Lights saves a lot of configuration and logic locally on your bridge, so you can use amazing features even when your iOS device is powered off: recurring schedules, sunrise/sunset actions, Hue motion sensor rules, and Hue dimmer switch/Hue Tap button actions. Super efficient optimizations allow you to add more devices to your bridge. You can exceed the advertised device limit and run very complex configurations on a single bridge. Everyone has access to the embedded daylight sensor within your bridge. This sensor uses GPS coordinates to calculate sunrise and sunset times. You can now automatically turn on groups or scenes at sunrise and sunset. These times will change throughout the year based on your location. The Philips Hue Motion Sensor is a great addition to any Hue environment. It should be one of your first non-LED accessories. You can also get the generation 3 bulbs with more saturated green and blue colors, and Hue light fixtures. There are now 3 generations of Philips Hue bulbs. If you want to get the latest generation, make sure the outside of the package shows the "Richer colors" logo towards the upper right of the box. The deeper blue and green colors really shine with the Hue Lights water effect. 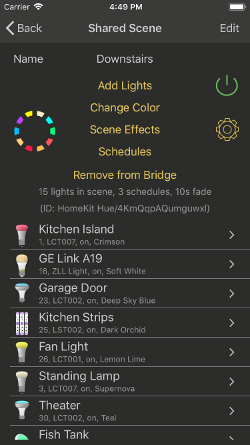 Did you migrate your bridge from version 1.0 (round) to HomeKit version 2.0 (square)? If you lost some bulbs during the migration and can't control them, Hue Lights can help! The free version of the app includes the latest Touchlink functionality within the Set Up menu. If you place your bulb near the hub and invoke this Touchlink feature, you may reassign the bulb to your bridge. Non-iOS users can invoke the steps manually: Touchlink Steps. 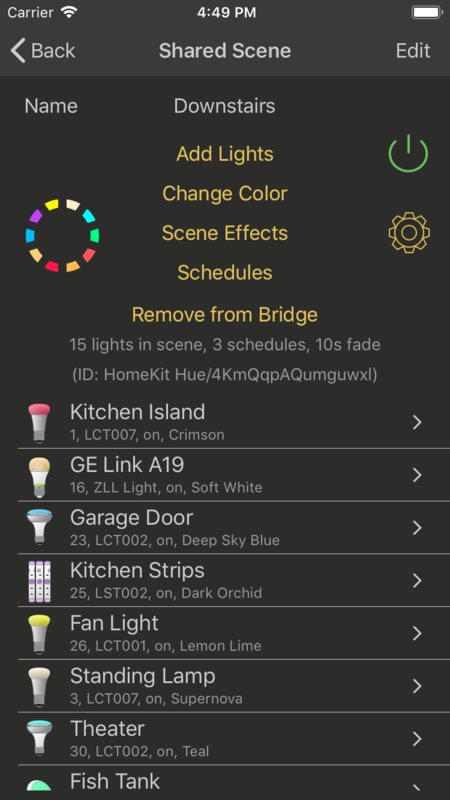 Your Philips Hue bridge and Hue Lights app work great with IKEA TRÅDFRI LED bulbs, GE Link, OSRAM and dresden elektronik hardware. If the bulbs do not connect out of the box, try to use Touchlink. In some cases you may need to update these third-party bulbs with newer firmware using the manufacturer's hub. 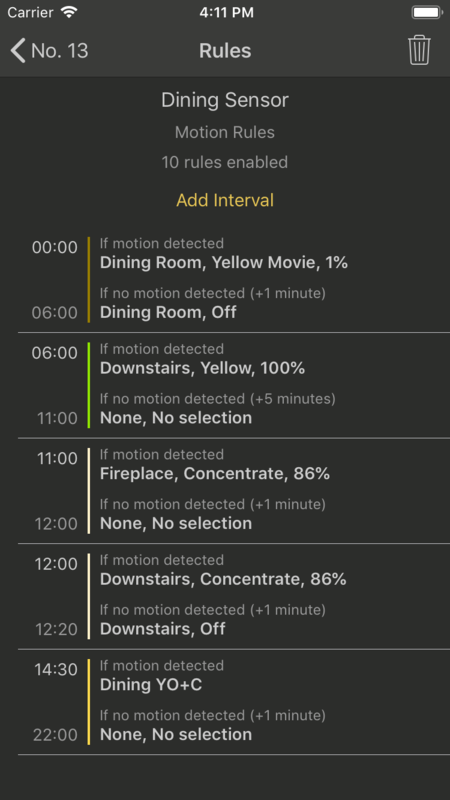 Hue motion sensor - Multiple time intervals can be created for your Hue motion sensors with distinct actions for motion and non-motion events. Create as many or as few as needed. Configure countdown times from 1 minute to 90 mintues for each time interval. 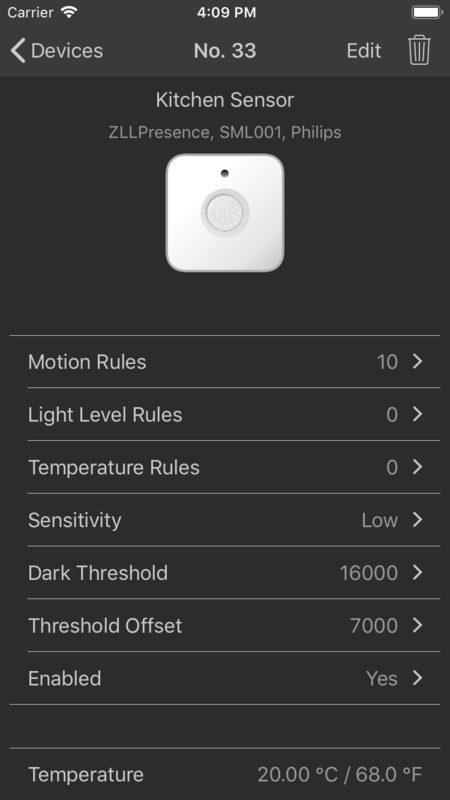 Turn on or off any combination of lights in your Hue environment for motion, temperature, or light level sensor levels. Use multiple motion sensors to create follow-me light sequences. See the FAQ for even more configuration options including temperature sensor and light level sensor rules; these use your motion sensor hardware, but can run independently from motion events. Sunrise/Sunset - Everyone can use the bridge's daylight sensor. Save your GPS coordinates on the bridge for automatic sunrise and sunset actions. Have your favorite scene or group turn on or off at sunrise and sunset. The activation times will automatically adjust throughout the year based on your location. Actions can be triggered exactly at sunrise/sunset or up to 2 hours before or after. Everything runs on the bridge, so scenes and groups will activate even when your iOS device is powered off. Hue dimmer switch and Hue Tap customization - Each button on the Hue dimmer switch and Hue Tap can be configured to control scenes, groups, or brightness. Map up to 8 scenes on a single Hue dimmer switch. Select different scenes or groups from the same button (e.g., short-press and long-press actions can turn on different scenes or groups). Change the brightness button speeds to 10 distinct velocities. 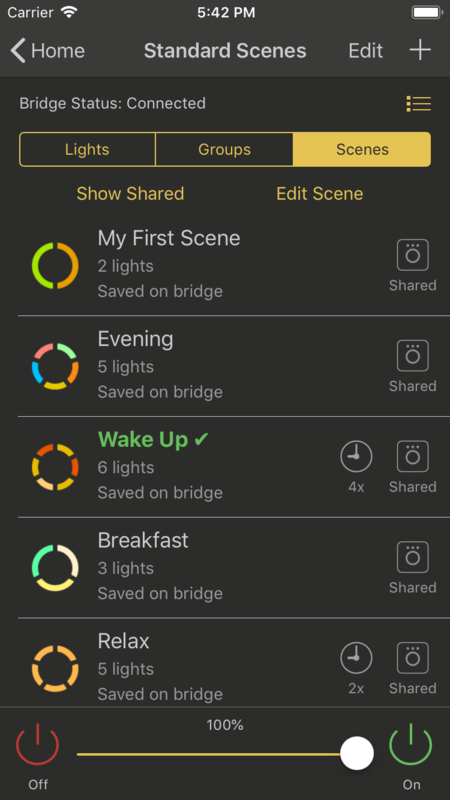 Bridge Scenes - Share and edit your scenes and groups directly on the bridge. See the exact light states of every ZigBee device used in a scene. 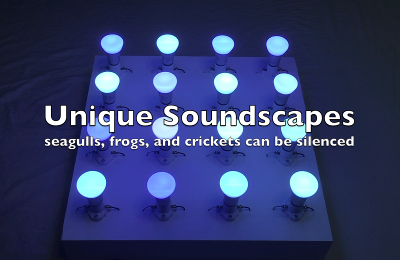 Sequences - Experience melodies of light for every mood, occasion, and event with Hue Lights sequences. Savor the 12 sample sequences or create your own using the powerful sequence editor. Add lights, groups or scenes to each step and assign colors, fade times, on/off actions, and effects. Add or rearrange steps to running sequences to get immediate feedback. The sequence dashboard will show all of the action as it happens with sub-second accuracy. 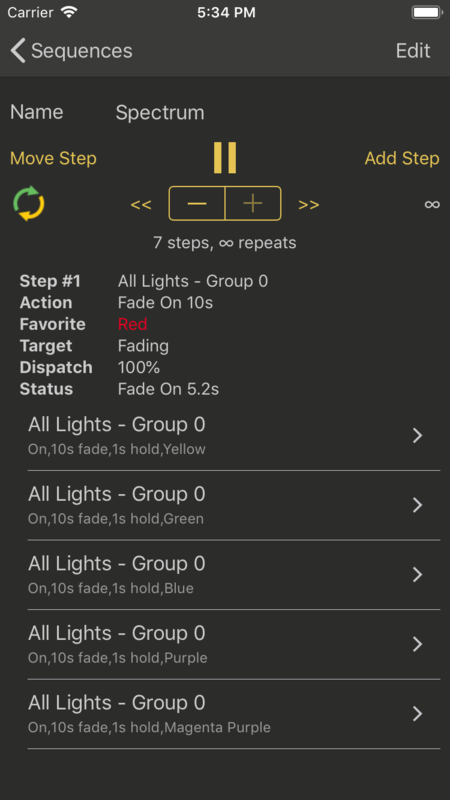 Several of the sample sequences work with the "All Lights" system group, so they even work in the free version of the app. Samples include Attention, Cold Recipes, Exercise Interval, Heartbeat, Holiday Cheer, Movie Start, Nebula Point, Spectrum, Sunrise, Sunset, Traffic Light, and Warm Recipes. 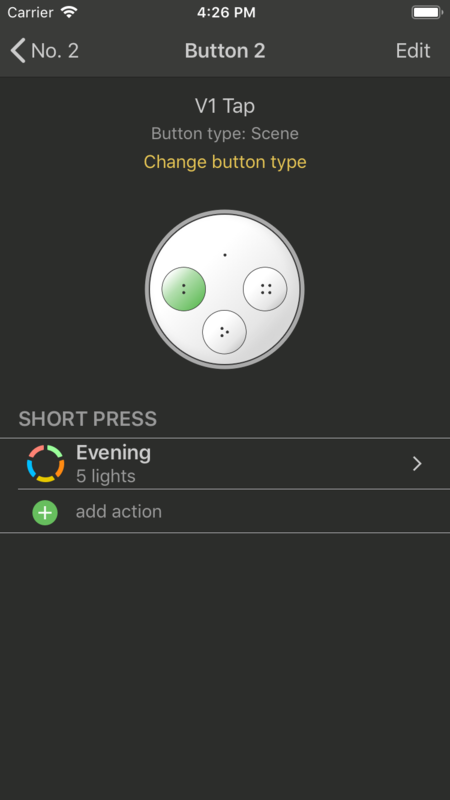 Shortcuts - Long press a row for quick actions (on, choose color, edit, off). Swipe left or right to switch screens. Quickly change group colors with widget. 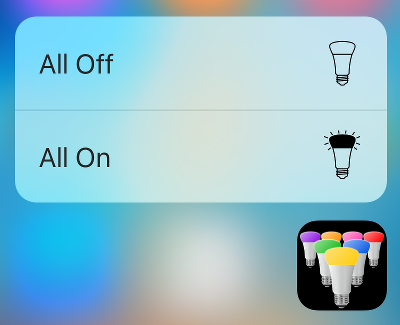 3D Touch - iPhone 6s and iPhone 6s Plus users can turn on or off all lights with a deep press of the Hue Lights icon! Push down hard on the icon to bring up the new controls. Perfect Sunrise - Wake up peacefully with the perfect sunrise from Hue Lights! Your lights will change through thousands of precise sunrise colors as they slowly brighten. Schedule multiple sunrise times for weekdays, weekends, or individual days. 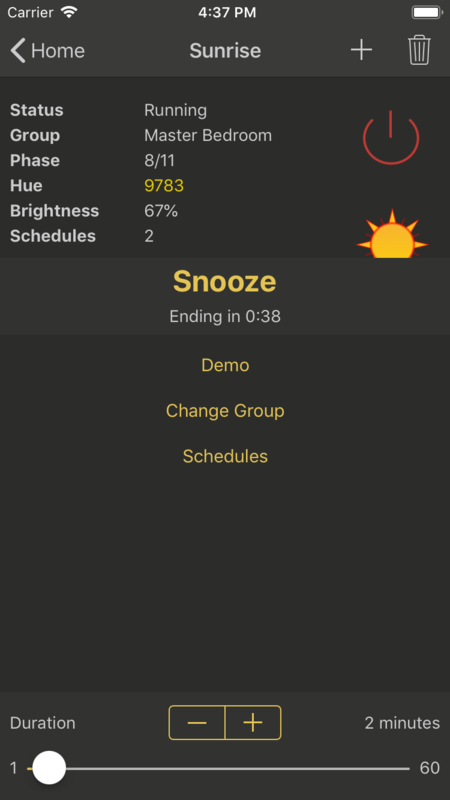 The schedules and sunrise simulation run 100% on your bridge, so your mobile device can be powered off. 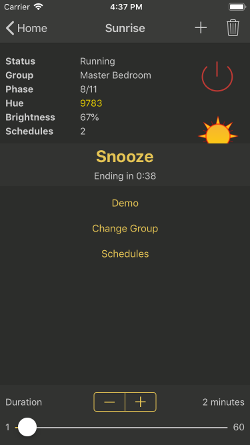 The perfect sunrise feature includes an integrated snooze function. 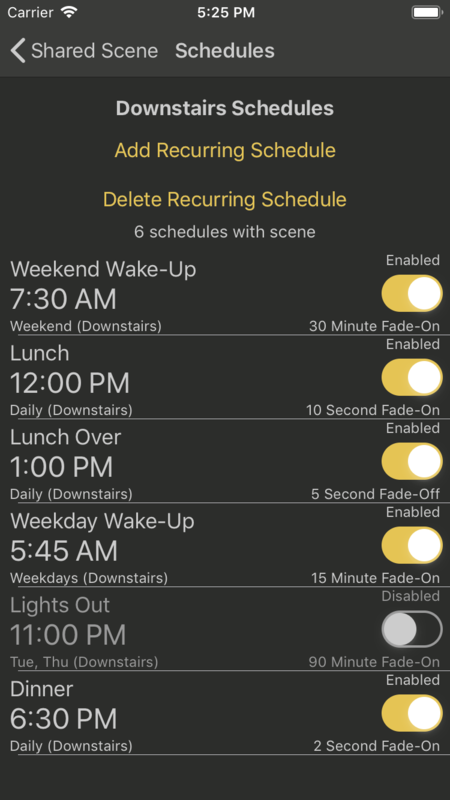 At any time during the sunrise sequence you can turn all of your lights off with a Hue Tap, dimmer switch, widget, or app. The lights will resume the sunrise sequence when the snooze timer expires. You can also start a sunrise sequence using a Hue Tap, dimmer switch, motion sensor, or daylight sensor. The total duration of this sequence is configurable from 1 minute to 60 minutes. Water Simulator - Ride the wave of the future with Hue Lights! Tune each water simulation with dedicated controls for seagulls, frogs, and crickets. High quality audio clips offer seamless loops and clean, ambient sounds. 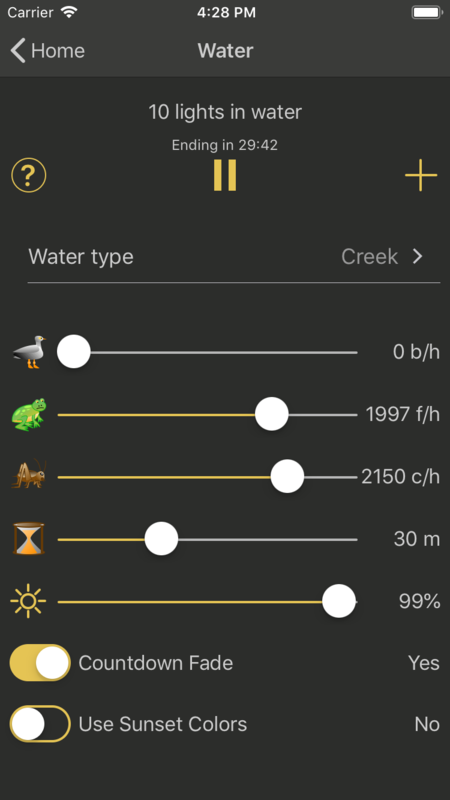 Listen to seagulls, frogs, and crickets in millions of different locations, near and far, as the app moves them through space and time using advanced soundscape algorithms. Each water type offers unique themes that slowly change the colors in interesting and dynamic ways. You can also use sunset colors for any of the water types for a relaxing, slowly dimming nighttime routine. Escape to the beach every night with Hue Lights! More details are available in the Hue Lights press release. 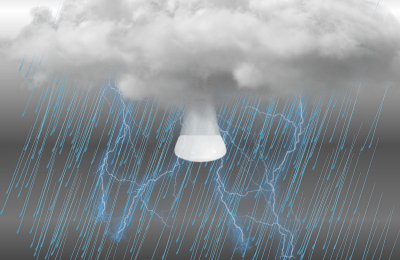 Advanced Weather Simulator - Your Hue Lights are ready to rumble with stupendous thunderstorms! Read the Press Release for more details. 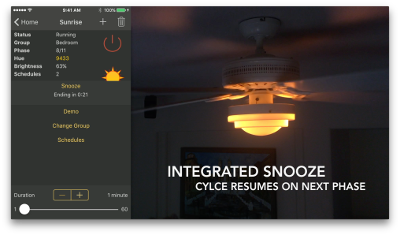 See and hear the Hue Lights weather simulator in action: Watch the 52 second demo video! Watch your lights gently change as the storm progresses. Lights will shift positions, colors and brightness to create a relaxing ambiance. Brightness, color, animation speed and volume can all be adjusted to create a personalized storm. Adjust controls in real-time and immediately see the effect. 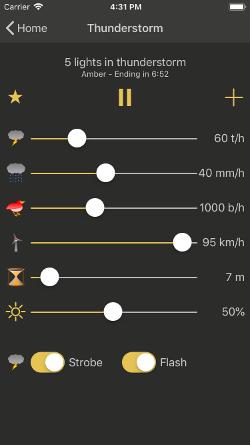 Start a timer and fall asleep to the gentle sound of rain and peaceful birds. Lightning, thunder, rain and birds can be individually adjusted or disabled to create a wide variety of storm conditions. Fire Simulator - Ignite your Hue Lights with a fiery spectacle of animated colors and striking sounds! Read the Press Release for more details. 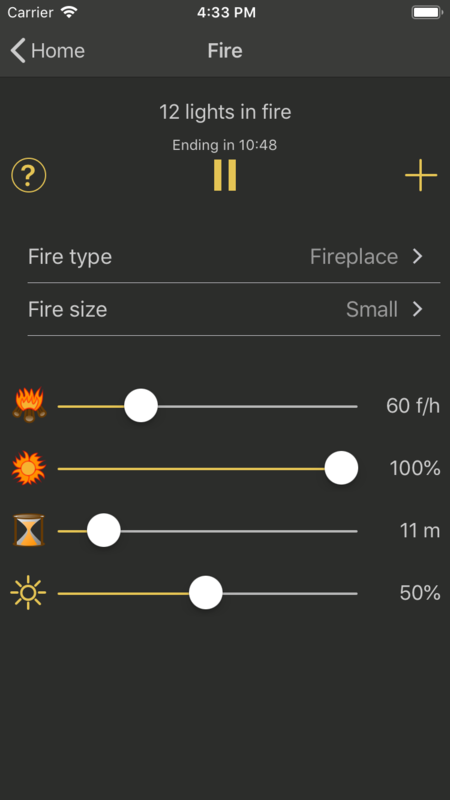 See and hear the fire effect in action: Watch the 41 second demo video! Watch your lights flicker and change as the fire burns. Lights vary from bright yellow and orange flames to dimmer reddish embers. Flare-up frequency can be changed from 0 to 240 flare-ups per hour. Fire types include fireplace, campfire, brush fire and forest fire. Enjoy professionally recorded sounds. Add wood to each fire type to increase the visual and audio dynamics. 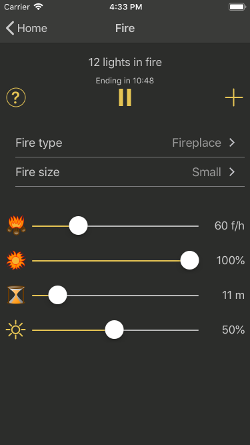 Start a timer and fall asleep to the relaxing sound of a crackling fire. When the timer expires your lights and audio will turn off. Activate Scenes and Groups from your Lock Screen! Download and try the app for free with your first 2 available lights. If you don't have any hardware yet, take a look at this video review from NewsWatch. It shows the Hue Lights app working with Philips Hue bulbs. 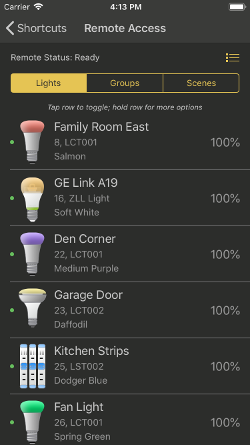 Hue Lights dynamically updates the Home screen with your recently used scenes and groups. This optimizes the time it takes to find and activate your favorite scenes and groups. Includes 43 favorite colors across Hue/Saturation, Color Temperature, and X/Y Point color modes. 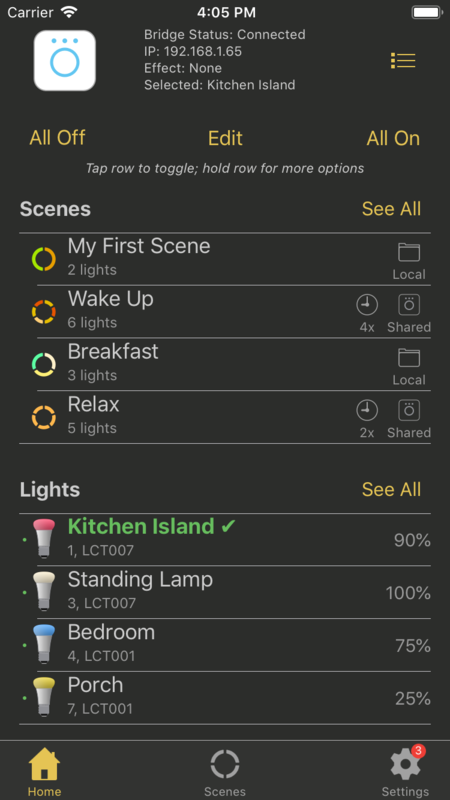 Includes 35 pre-defined scenes including Light Recipes, Colorloop, Alerts, and Transitions. The free version allows control of your first 2 available lights. In-App purchases can unlock all lights and more scenes. Requires Hue Personal Wireless Lighting Starter Set to operate. Localized in English, German, French, Dutch, Danish, Spanish, Chinese, Japanese, and Korean. The Philips Hue E14 bulbs and 3rd generation BR30 bulbs are now available from Amazon (US market). The smaller E14 form factor is common in chandeliers. These new bulbs support richer colors (e.g., better blues and greens). The latest generation 3 Hue bulbs offer more saturated colors (similar to Lightstrip Plus, Bloom, Iris, and Hue Go). Light fixtures with embedded Hue LED components are also available. If you want to get the latest generation, make sure the outside of the package shows the "Richer colors" logo towards the upper right of the box. The generation 3 bulbs have improved blue, cyan, and green colors. 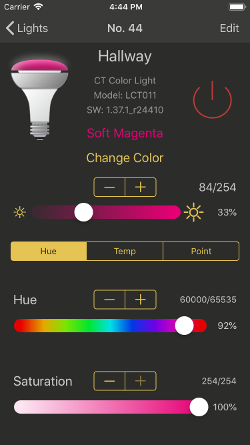 Make sure to use the Hue Lights app to get the perfect color combination! The deeper blue and green colors make the Hue Lights "Water" effect look great. Try the Philips Hue White Ambiance A19 bulbs to get a range of dimmable, white lights. These bulbs allow you to set various shades of white from warm to cool. On October 6, 2015 Philips released their HomeKit compatible bridge along with new A19, BR30, and PAR16 bulbs. The LightStrip Plus was also released with brighter light output (1600 lumens at 4200K), a white channel (useful for relax, concentrate and other white-channel scenes), and an extension kit. With the extension kit you should get consistent colors for lengths up to 10 meters (32.8 feet). You can control this new hardware or any of your existing hardware with the new Hue Dimmer Switch. LightstripPlus Installation Tip - If you are installing the latest Lightstrip Plus in your kitchen as under-cabinet lighting, an extension cable can help connect the left and right sides. For example, you may need a non-lit section over a stove or range. Hue Lights takes the latest Philips Hue A19 LED bulbs for a test drive. Compare the bulbs side by side! Expand your Hue Personal Wireless Lighting Starter Set with a variety of compatible Friends of Hue products. These high quality items from Philips offer the perfect complement to your Starter Set and all work great with the Hue Lights app. The LightStrips and Bloom items give deeper saturation than the regular A19 or BR30 bulbs. They are perfect for accent lighting including over counter ceiling accents. 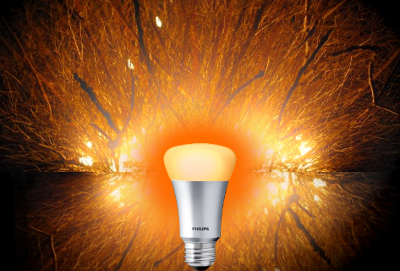 The Hue Lux is similar to the colored A19 bulb, but just supports dimming with a 2700K color temperature; it is usually about 1/3 the price of the colored A19 bulb. In less used areas you should take a look at some of the offerings from third-party manufacturers including IKEA TRÅDFRI and GE Link LED bulbs. These budget bulbs are supported in the Hue Lights app. Include them in Scenes, Groups, and the Widget. Hue Lights has full support for these on your iPhone and iPad devices. Together with the Philips Hue Hub you can operate your GE Link LED Bulbs with sub-second response times. You can even include the GE Link LED Bulbs in Schedules! With a schedule you can slowly dim or brighten these lights from 0.4 seconds up to 90 minutes. The schedules are stored on the Philips hub. This lets them run even when your iPhone or iPad are powered off. Compare the price on these against the comparable Philips bulbs since third-party prices fluctuate quite a bit. If the third-party bulb price isn't cheaper than the Philips equivalent, you will have much better luck with the Philips bulbs. Hue Lights works with third-party products that support the ZigBee Light Link standard. The app has been tested with products from Philips Hue, GE Link, OSRAM, and dresden elektronic. These other ZigBee products can be a great complement to your original Hue Personal Wireless Lighting Starter Set. Note that some users have reported issues with the US-version of the OSRAM Lightify Tunable A19 White Light. The European version of this bulb works out of the box with Hue. If you are looking for longer light strips, take a look at the 3 meter (9.8 feet) light strips from dresden elektronik. These are 50% longer than the Philips LightStrips and support RGB strips. The bundled strip is RGB, but the controller even supports RGBW strips. Live the future today with Hue Lights! Starting with Hue Lights v3.1 you can create custom, multi-room scenes and activate these with Amazon Alexa. Voice control requires the Philips Hue V2 square bridge. The Amazon Echo Dot is a low-cost, powerful addition to your Hue environment. See the latest FAQ for steps to create a custom scene for use with Amazon Alexa. Hue Personal Wireless Lighting is a trademark owned by Koninklijke Philips Electronics N.V., see www.meethue.com for more information. Hue Lights and LapApps, LLC are in no way affiliated with the Philips organization. LapApps, LLC is a participant in the Amazon Services LLC Associates Program, an affiliate advertising program designed to provide a means for sites to earn advertising fees by advertising and linking to amazon.com.